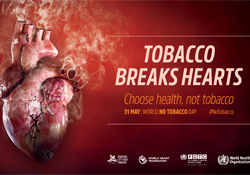 In 2018, World No Tobacco Day (WNTD) will focus on "tobacco and heart disease". Cardiovascular diseases (CVD), including stroke, are the world’s leading causes of death, and tobacco use is the second leading cause of CVDs, after high blood pressure. CVDs kill more people than any other cause of death worldwide, and tobacco use and second-hand smoke exposure contribute to approximately 17% of all cardiovascular deaths globally. In the WHO European Region, CVDs cause around half of all deaths. Of the 6 WHO regions, the highest overall prevalence for smoking in 2017 was estimated to be in the European Region, at 28%. The campaign for WNTD aims to increase awareness on feasible actions and measures that key audiences, including governments and the public, can take to reduce the risks to heart health posed by tobacco.